This Light Award is sponsored by the I Create Reality App and processed through Kiva.org. Vasil has been working in agriculture for 18 years already. He has at his disposal three plots of land totaling 24.69 hectares. On these he grows various crops: wheat, barley, berries, pumpkin, etc. 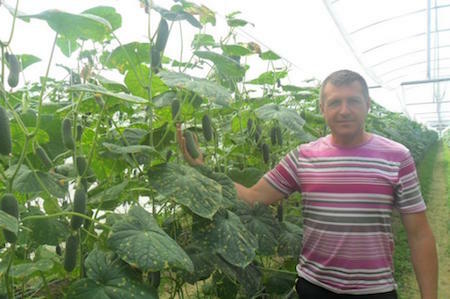 In addition, on this land, he has a greenhouse measuring 10/100 meters where Vasil grows cucumbers and eggplant. He inherited this business from his parents. Vasil is married and has two daughters. He loves his work, but every year he certainly finds time for his family and takes them somewhere on vacation to rest. With the revenue he receives, Vasil will again invest in his business and will put aside just a small amount to make repairs to his house. For now this house isn't inhabitable, and so his family currently lives in an apartment. Vasil has always loved to dream big and to work confidently toward his goals. And this time he would like to invest 110,000 UAH into two additional new greenhouses measuring 7/100 meters. Along with the funds received from Kiva, Vasil plans to also invest what he has in this new venture.